These are in production and will be delivered Q1 2019. Broadway Limited Int. 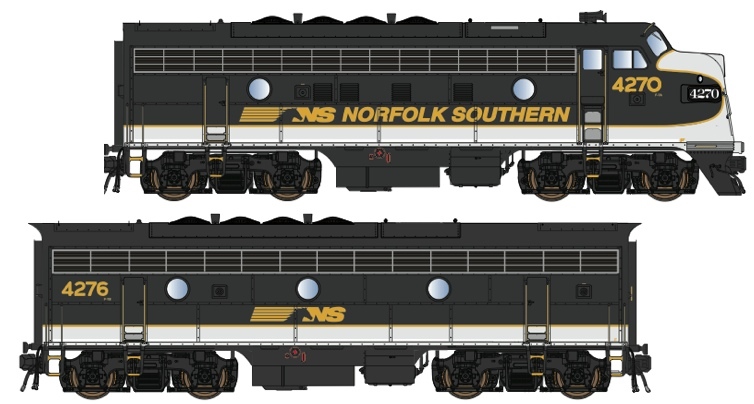 is producing these exclusively for Lowell Smith Signature Series and this OCS Series train. Set 1 includes F-7A unit road number 4270 & F-7B unit 4276. The B unit in the set is a ‘dummy’ engine with no power mechanism. The powered A unit will have ‘Dual Mode’ decoders, so these work both DC and DCC. Horn and bell sounds performance in DC are activated by an accessory sold separately by BLI called ‘DC Master’.